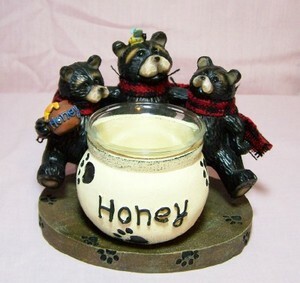 This candleholder depicts 3 small bears sitting around a glass candleholder which is a honey pot. They all have red & black neck scarves on. One is holding a honey pot and the middle one has a bug on his head and they friends. Cute. Made of cold cast ceramic this is a perfect gift. 5"x4-1/2"x4-1/4"